Summary: Has a small footprint and is very easy to use. Nice aesthetic. Recommended for: Casual coffee drinkers who want to experiment with roasting their own beans in small batches. Probably too low capacity for a serious home roaster. Do you consider yourself a casual coffee drinker? 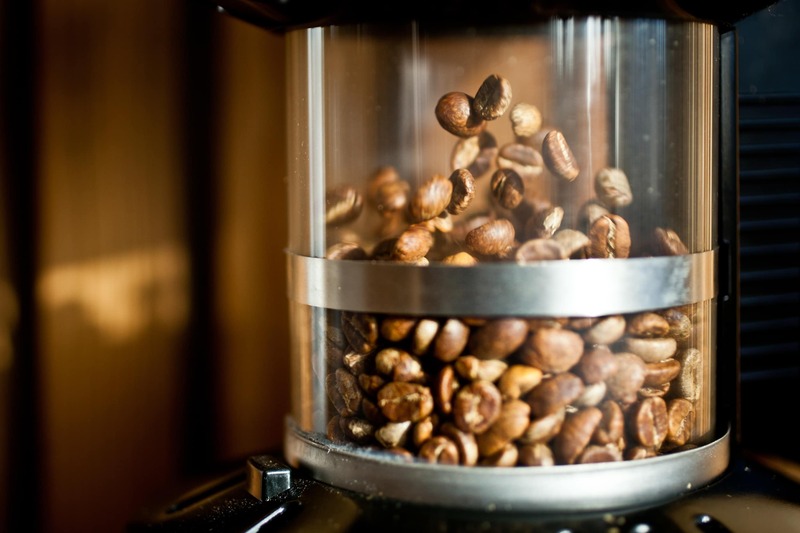 Have you been toying with the idea of roasting your own beans to experience the ultimate in fresh coffee flavor? If you answered yes to either of those questions, then you’re going to be intrigued by our Fresh Roast SR700 review. While the machine does have certain limitations and shortcomings, it’s an excellent option for a beginning home roaster, especially if kitchen counterspace is at a premium in your home. We’ll cover everything the SR 700 can (and can’t) do in the sections that follow, so you’ll have all the information you need to make an informed decision. It’s not for everyone, but for the right user, it’s a solid choice! 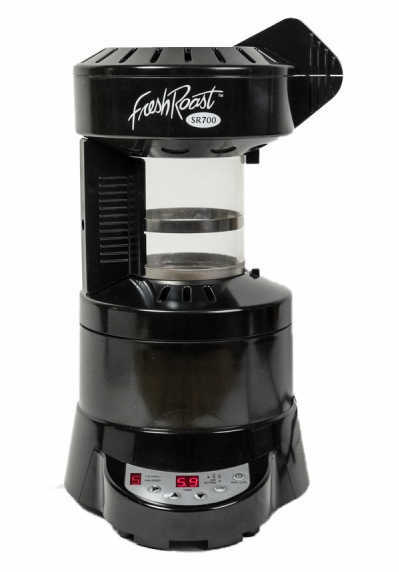 The ​Fresh Roast SR700 is one of the least expensive dedicated home coffee roasters on the market today. True, you can create your own makeshift roaster using materials from around your house, or buy a thrift store air popping popcorn machine for less. But if you’re looking for a machine designed specifically for the task, you’ll be hard-pressed to find a more modestly priced option. It’s also got a delightfully small footprint, measuring just 6” x 6” x 13” and weighing in at a scant 5.7 pounds. Even if you’ve got a tiny kitchen with limited countertop space, finding room for this handy little device is easy. And moving it about if and as needed is a trivial matter. It’s also a relatively handsome machine, decked out in a mix of glass and sturdy black ABS plastic, which means it’ll fit right into almost any home kitchen décor scheme. 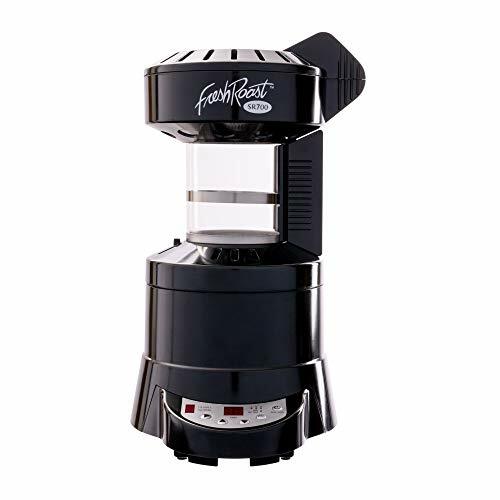 There’s one aspect of the Fresh Roast SR700 home coffee roaster that really makes it stand out in our mind: it’s got a USB port and is designed to connect to your laptop or computer. Once you connect it, you’ll be able to create, save and modify roasting profiles containing as many as twenty discrete steps, which allows you to really fine-tune the roasting process. Honestly, we were blown away by this feature. Our only real regret is the fact that it’s got a tiny bean hopper. You won’t be able to roast big batches in one go, but it gives you an insane level of control over the end to end process. Note that if you don’t want to connect the machine to your laptop, you don’t have to. In that case, it’ll use its default settings (i.e. 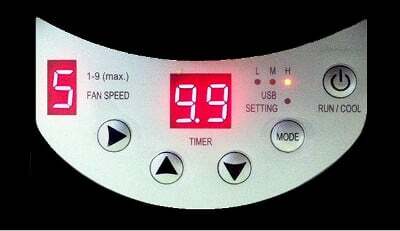 fan speed 5, timer 5.9 minutes, high heat), and you can adjust from there via the console on the front face of the unit. This software has a lively, helpful community. And between that and the SR700’s active Facebook page, which allows you to connect with other users and novice roasters, the Roastero software gives you the tools to get a lot of mileage out of your machine. It’s also quite a fun machine to watch, given that it operates a lot like an air popper, and the small glass chamber you pour the beans into gives you a great view into the process. The control panel is fairly intuitive and easy to use, too, which means the learning curve is fairly slight. You’ll be able to get started rather quickly (just a few minutes after setting the machine up if you want to), and you’ll get pretty solid results, even on your first attempt. Having said all that, there are some downsides, and we’ll cover those in the sections that follow. As we said at the start of our Fresh Roast SR700 review, the machine has a very small capacity. You can only roast four ounces of beans at a time. If you’re a power drinker, this won’t simply be enough. You’ll find that you’d have to spend an inordinate amount of time using the machine and roasting small batches to keep pace with your habit. Casual coffee drinkers, of course, will not have this problem. So, if you are a casual drinker and don’t plan on roasting beans for family and friends, this model should serve you well. The Fresh Roast SR 700 doesn’t come with any built-in presets or profiles, which may make you scratch your head wondering why we gave it a perfect five-star rating where customization options are concerned. The answer has everything to do with the fact that you can use either the proprietary software or some open-source variant and create as many custom profiles as you like. Early on, when you’re roasting your first few batches, you may not see the need. But invariably, at some point, you’re going to want to start experimenting. When that day comes, you’ll find a dizzying array of options at your fingertips. The smoke suppression tech used in the machine is good but falls well short of greatness. When you use this machine, you’re definitely going to want to turn your stove fan on, and probably open a window, too. Even then, it’s at least 50% likely that you’ll trigger your kitchen smoke alarm. So don’t be surprised if and when that happens. The darker you roast your beans, the more likely you are to set the smoke alarm off. So as an added step, we’d recommend just pulling the battery out before you start, unless you just enjoy that insanely loud, shrill sound. The SR700’s chaff management is simple and fairly effective. As chaff is produced, it’s designed to fall into the unit’s lower chamber. After each roast, you’ll want to take out the chaff collection chamber and empty it. Be careful though, it’s fairly fragile. The chaff collector and the glass chamber are easier to break than we’d prefer. That’s partly due to the materials used in its construction. And since it’s a low-cost machine, it isn’t as sturdy as more expensive roasters. Using the Fresh Roast SR700 can be as simple or as complex as you want it to be. If you don’t want to create custom profiles, then don’t bother to install the software on your laptop or connect the machine to it. Just load the glass chamber with beans and turn it on. You’ll then be able to adjust the temperature settings and interrupt the roasting process to start cooling when you deem them ready. Be aware that the machine is a little on the noisy side. So, if you’re not standing or sitting very close by, you may not hear the first or second crack. That’s not a deal breaker by any means, but it is something to be mindful of. Also, note that the SR700 does have a bit of a consistency problem. Given the way the unit is designed, your beans won’t heat up as evenly as they do in traditional drum-based systems. This can lead to “zebra-striped” beans, or roasts with more color variation than you’d like to see. Still, it produces a great cup of coffee that far exceeds anything you’ll get at the grocery store. But it is a significant limitation. If you want to get more involved and take a more hands-on approach to the roasting process, then you’re going to want to use a software to create a custom profile. Exactly how that works depends on which software you opt to use. Here, our recommendation is to forget the program that comes with the included CD when you buy the machine and opt for the open source program we referenced earlier. Not only does it have a better interface and give you more options, but the community is incredibly helpful. If you have any questions or problems, help and advice are always close at hand. The bottom line here is that even though this is a low-priced roaster, the option to create and modify profiles with the software gives you a vast array of possibilities, controls, and capabilities that far exceed what the machine itself would normally be capable of that makes it a tremendous value. A good rule of thumb is to thoroughly clean the machine after about every five roasts, using a gentle, non-abrasive cleaner. Note that if you like darker roasts, you’ll probably need to clean the unit more frequently. Good thing, since the main chamber is glass, you can clearly see when it needs attention. It’s pretty easy to disassemble to get to the dirty bits. So, just take it apart as needed, let it dry completely, then reassemble. And you’re ready for the next use. There’s a lot to like about the Fresh Roast SR700. It’s easy to use and user-friendly. 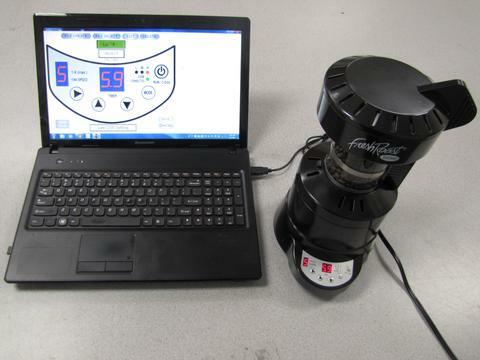 At the same time, if you’re at least a little tech-savvy, you can make use of the software to create highly detailed roasting profiles that give you a surprising amount of control over the process. Plus, it’s got a delightfully small footprint, meaning it’ll fit into most any home kitchen. If you can live with those limitations, this is a solid choice. And that’s a wrap on our Fresh Roast SR700 review. On the whole, we like the machine very much. But we urge readers to be mindful of its limitations before making a purchase decision. If you’re a power drinker or looking for a home roaster that can produce highly consistent results, this one is bound to leave you wanting. But, if you consider yourself a casual coffee drinker or just looking for something low cost and easy to use that produces decent quality roasts without overly complicating things, then the SR700 is probably a great machine for you. 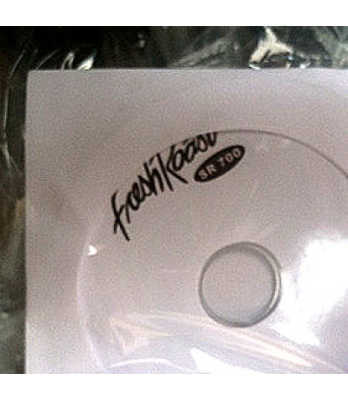 Fresh Roast SR700 Operating Manual. Coffee Roast Guide. National Coffee Association of U.S.A.
What Can You Do With Coffee Chaff? Rounton Coffee Roasters.